Only moments from the city, connected by cable car, a boardwalk, a train and a bridge, Sentosa is known as Singapore's playground. Offering pure happiness through 500 hectares of retreats, sandy beaches, rainforests, award-winning spas, resort accommodations and themed attractions it is a very popular hangout on weekends when families and friends gather there for some fun time. Once on the island, there are busses and trains to bring you around and they are included in your initial admission fee with stations all over the island. 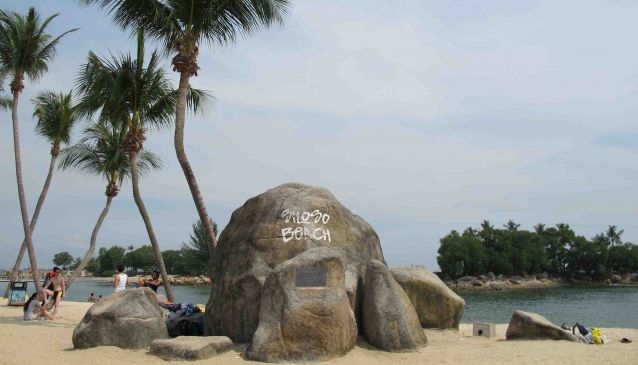 All three beaches -Siloso Beach, Palawan Beach and Tanjong Beach, are well maintained and well equipped with showers and convenience stores. Some of the beach restaurants and bars also offer sun beds at the beach, which you can rent for a daily or hourly fee. You will also find brochures and maps once on the island as well as info counters with friendly and trained staff to answer all your questions. Since 2010 Singapore's first integrated resort called 'Resort World Sentosa', South East Asia's first Universal Studios theme park, is part of the islands major attractions. With a casino, a shopping mall, a maritime museum, a water fun park, an aquarium, a night show and several restaurants, it is something not to be missed and will entertain both adults and children from morning to night. With numerous unrivalled offerings, Sentosa Island is bustling with fun to be had and stunning views to be seen. It is popular among locals and a must for travellers. Make sure to set aside at least a half-day for a Sentosa excursion. Read our travel article about Sentosa to know more about the top attractions in Sentosa and our region page to get a better idea about how to reach the island.